Or blazer-o-kimono. I believe you can call this piece many things. I mean, many ways. But one thing is for sure... it's a super alluring and interesting item. I would call it statement but still simple enough. 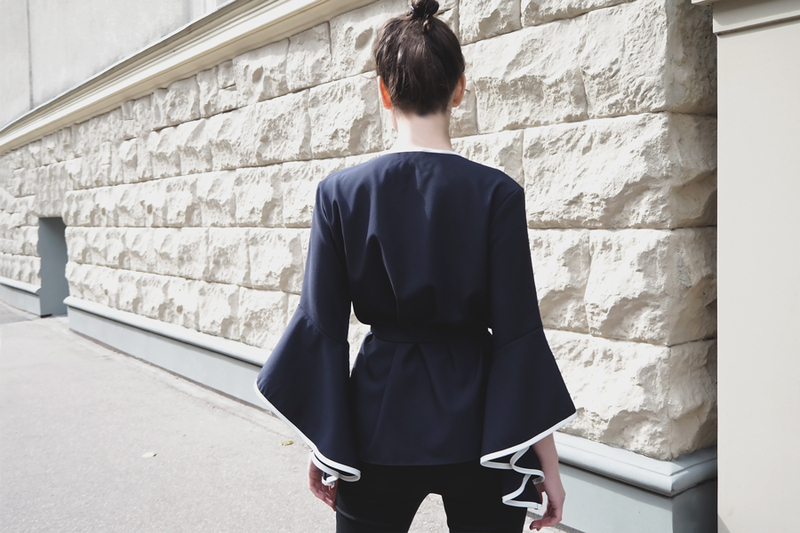 It's sure the sleeve kind of thing that adds a twist to the blazer... or blouse... or kimono. It's the sleeve kind of thing that adds dynamics and this feeling that you got wings, just like a migratory bird. Also, I feel like pointing out here that this piece is more of a deep blue shade rather than black as they state it at Zaful. Speaking of this visual story's mood, I would put it as 'last summer-y bits'. Maybe because it's mid-September and this proper autumn mood is affecting me now. I feel like wrapping up in tons of layers. No, not like that. I'm actually in the mood of layering. Probably due to the fact I got myself ready for the season in advance. But, well, let's hold this talk back for some time. Now, today's triple-colored outfit. As I said above this kimono style piece is rather in a deep blue shade than black and this was a bit unexpected as I planned the outfit being the black-and-white one. So at first I was somehow puzzled by the fact. But this way the combination looks fresher, in my personal opinion. Another perfect idea for the transitional period. Lovely outfit! I adore this top and you styled it perfectly! Wishing you a good day too!